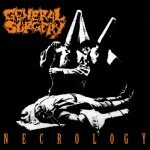 Relapse Records will re-issue GENERAL SURGERYs 1991 debut EP Necrology this June. The long-out-print EP has been completely remastered by Scott Hull and repackaged with three previously unreleased bonus tracks. The Necrology re-issue will be available on June 21st on CD and digitally and is up for pre-order now at this location. Not only will the EP be re-relase on CD with bonus tracks (all three songs from Demo 2 1990), the same tracks will also come out on a limited 10″ vinyl later in the year.